Most inflatable boats, SUPs, and kayaks include a pump in their packaging upon purchase. But, let’s face it. Yes, they can get the job done, but most of these pumps are not as powerful or effective in inflating your inflatables. So if you’re thinking of upgrading your pump to one with higher performance, look no further. 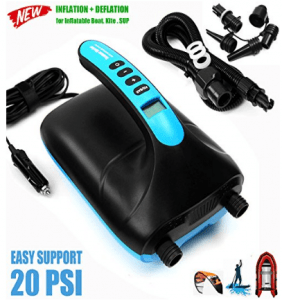 I have researched 7 of the best electric and manual pumps available in today’s market, along with some great tips about inflating your boats, dinghies, SUPs, and kayaks. As you may already know, there are two types of pumps you can use for pumping air into your inflatables. Both of these pumps have their own advantages and disadvantages. But to give you an idea about their features and uses, let us discuss each type further. 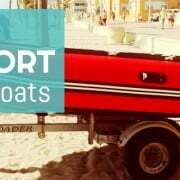 An electric pump alleviates the inconvenience and strain of inflating your boats, boards, and kayaks. They are relatively easy to use: Plug it in, turn it on, and watch as it easily inflates your boat. Electric pumps save you energy and time in blowing up your inflatables. However, there is are also downsides in using this efficient little tool. For starters, an electric pump will need a power source. Most of them need a wall outlet, but some can be powered by cigarette lighters or even car batteries. Some of them even feature a rechargeable battery. 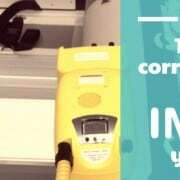 This being the case, you cannot be assured that there will always be an available power source for your electric pump. Next, electric pumps alone cannot inflate your inflatable boats and kayaks to its 100% capacity. This is due to its lack of the required pressure power. You will find yourself having to top the chambers up with air from a manual pump in the end. However, you can use a 2-stage pump as an alternative. These nifty little tools have a higher pressure output, which can conveniently pump air into your boat up to 15 PSI. Nevertheless, 2-stage pumps can be really expensive, with an initial starting price of $100. Lastly, electric pumps risk over inflation for SUPs. Unlike in boats, boards are pretty easy to pump air into. With this in mind, you have to handle and watch over inflating SUPs carefully when using an electric pump. Manual pumps are further divided into two (2) categories. A foot pump, as the name suggests, has to be pumped using your foot. This kind of manual pump is what usually comes with your purchased inflatable boat. You can buy foot pumps at any retailer basically. Meanwhile, hand pumps require you to pump using your arms. For many manual pump users, hand pumps are the preferred tool over foot pumps. This is because foot pumps usually take more time to inflate because of the limited air output they can produce. Hence, we will be focusing more on hand pumps in this article. In general, they are far more affordable than electric pumps. You won’t need to worry about a power source, as they solely rely on mechanical energy – or in simple terms, your energy. However, this can also be a disadvantage: hand pumps are user-friendly, but they can be tiring and strenuous to work with. Especially if you will have to pump air into big inflatables, like kayaks and boats. Hand pumps alone can inflate your boat up to the proper pressure required. They do take more time to pump air into your SIB, but they can get the job done effectively. You may have heard the terms high-volume and high pressure being thrown around, but not know exactly what they mean. When we talk about high-volume pumping, we talk about the volume of air being moved from the pump. When you need to inflate a boat, you can first use a high-volume pump to get a lot of air into the tubes quickly. High volume pumps do not produce enough pressure to fully pump up an inflatable boat though. You have to top it off with a manual pump, or a high-pressure electric pump. Vice-versa, high-pressure pumps do not move air as quickly. They force their air into the inflatable to a much higher pressure, which is vital for SUPs and air floors of inflatable boats. In contrast to its name, NIXY Paddle Board Electric Pump is not just for SUPs. It is an efficient air pump for all inflatable boards and kayaks that have H3 valves. Nevertheless, you can also use it for other models, but you will have to purchase a universal adapter. 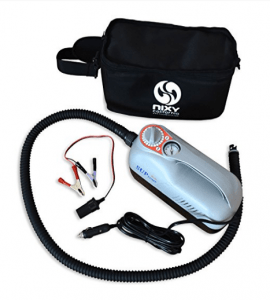 This electric pump draws power from vehicle accessory outlets (ex. car’s cigarette lighter outlet) and the vehicle’s battery itself using the alligator clamp included in the package. It features high-pressure inflation of up to 20 PSI, and has an auto-shutoff feature that enables it to automatically stop when it reaches the inputted PSI level. It has an inflation speed of 1 PSI per minute. Comparatively, it is a little slower compared to other electric pumps, but it does produce less noise compared to others also. The pump operates in two (2) stages. The initial stage is less noisy and it rapidly pumps air into your inflatable up to at least 1 PSI. After this, the second compressor kicks in; this is the second stage of inflating. It will noticeably produce louder noise as it pumps air into your inflatable boat, board, or kayak the rest of the way. One of the highest performing electric pumps on the current market is the Sea Eagle BTP Mano Turbo Pump. This model is specifically designed to meet the needs of high air volume inflatable boats and kayaks. It has high-pressure inflation of up to 14.5 PSI. Depending on the size, it can quickly inflate your gear under three minutes. The pump draws power from a 12V battery. You can either connect it to a vehicle’s accessory outlet or a car’s battery using the alligator clamp included in the package. You also have the option to purchase a 12V battery pack instead. Aside from its effectivity as an electric pump, it is rather well known for its flexibility and compatibility. With the inclusion of some common adapters, it can accommodate several valve types. The pump has two stages of operation as well. In the first stage, it features a high turbine blower that rapidly blows air into your inflatable watercraft until there is significant resistance. After this, the second stage begins with a high pressure piston kicking in, filling the inflatable up to the required PSI value. You will not have to worry about overinflation as well for it has an auto-shutoff feature, which automatically stops the pump when it reaches the target PSI level. The Sevylor SUP and Water Sport Pump is a high-performance electric pump, with a reasonable price tag. It has a pressure output range of up to 15 PSI. 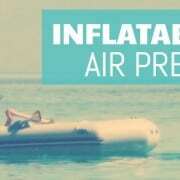 This can conveniently inflate large watercrafts in under 8 minutes. To operate, it has to be connected to the cigarette lighter outlet of your vehicle. Nevertheless, the pump can also draw power from a 12V battery pack. The Sevylor electric pump has H3 connectors, but has adapter inclusions that are compatible with Double Lock, Mini Double Lock, Boston, and Pinch valves. This makes it compatible with most inflatable watercrafts. Another convenient feature it is equipped with is the option to input values of PSI, KPA, or mbar on the LCD pressure gauge. It also has an automatic shutoff feature that enables the machine to shut down upon reaching desire pressure level. The Seamax Double Stage Electric Air Pump is considered to be one of the most reliable electric pumps on the current market. This is the pump I use a well. It is constructed with marine grade ABS and nylon materials, which can prevent saltwater oxidation that can result in corrosion. This pump has a high-pressure inflation range of 20 PSI. It can easily inflate a regular-sized watercraft in no more than 5 minutes. It also features a digital pressure gauge that shows the pumping progress of the machine. It also has an automatic shutoff feature that ceases the operation after reaching the desired PSI level. It is also programmed to shut off after 20 minutes of operation as a safety feature. By default, the Seamax Electric Pump is only compatible with Halkey-Roberts and Bravo valves. However, the package includes five (5) universal adapters, which allows it to work well with other types of valves. 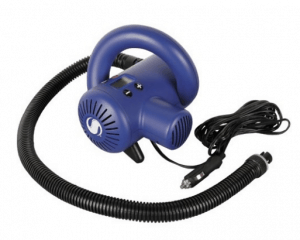 The K-Pump K20 Air Pump is one of the best manual air pumps in the current market, period. It is constructed with marine grade ABS, giving it a durable exterior that can last a long time. It weighs around 2 lbs, and is 21 inches long. It is both compact and portable, making it convenient to bring anywhere. Thanks to its small size, you can carry it with you in your boat on longer trips, in case you need to top it off. The K-Pump K20 has a unique two-stage design consisting of the high-volume and high-pressure modes. The modes are interchangeable by a simple twist of the wrist. It works similarly like two stage pumps. 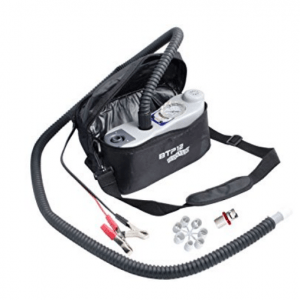 In the high volume mode, the pump allows quick inflating of the inflatable watercraft up to 6 PSI. Afterwards, you can make use of the high-pressure mode to reach up to 25(!) PSI. This manual hand pump includes an adapter for Leafield valves and an additional adapter for Halkey-Roberts valves, making it compatible to most inflatable watercrafts in the market. The K-Pump K20 is a bit on the expensive side, but it is very dependable and won’t let you down. 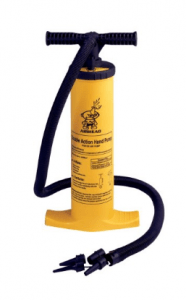 The AHP-1 Airhead Hand Pump, manufactured by Kwik-Tek, is a powerful manual pump that can push out 2 liters per stroke; this is four (4) times the amount of what a normal foot pump can produce. It is also known as a “double action” pump because of its ability to continuously pump air on both the push-down and the pull-up of the handle. It has a peak pressure of 14 PSI, which is more than enough to effectively inflate any inflatable watercraft. This model comes with 4 universal valve adapters, which makes it compatible with various types of valves. It is also equipped with a long hose that is 5 ft in length, so you can comfortably pump air in your inflatables at a considerable distance. 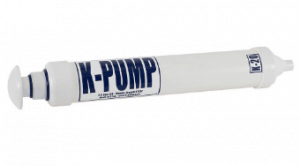 This NRS Super Pump is a durable high performing manual hand pump, which features a polypropylene housing and an aluminum shaft. Its construction allows in to withstand any form of use. This pump is convertible to a double action pump, which means it can pump in air on both up and down motions, using the red plug screwed into the top cap. Normally, it can push out 1.8 liters per stroke. But when converted to its double action mode, it can push out up to 3.6 liters per double stroke. Aside from that, this nifty tool has a built-in pressure gauge that informs you of the pressure level, eliminating the need to guess how much pressure is still required. 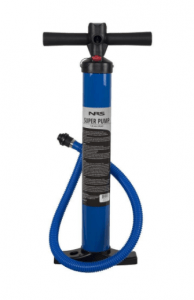 The NRS Super Pump allows you to pump air in your inflatable up to a pressure level of 20 PSI with ease. In terms of compatibility, it has adapters for both Leafield C7 & D7 valve and Halkey-Roberts New Short / Summit 2 valve. Read our article on how to correctly inflate your SIB. When inflating your inflatable boat, do not fully inflate the first chamber to its 100% capacity. Instead, fill it up to its 90% and move on to the next chamber; fill it up to its 100%, and then top up the first chamber to its 100% as well. This can help prevent damage to the connecting fabric of the tubes. High temperature from direct sunlight can cause the air in the tubes to warm up, which leads to an increase in pressure. As a precaution, learn when to vent out some air off your boat if you are using your boat in hot areas or during hot weather conditions; this can protect your boat from overinflation. Putting an inflated watercraft on the water can sometimes lower the air pressure in the tubes; this is due to the difference in temperature of the air and water – water usually has a lower temperature. In this case, a manual hand pump can be handy to top off some air into your chambers. Pro Tip: Most people just opt to get either an electric pump or a manual pump; however, it is wise to have both types of pumps. This can give you flexibility in dealing with various inflation issues you might encounter.